They see the smiles of a happy fun loving girl full of joy in her heart. We see the tears from the pain that keeps you awake at night. They see hopping and skipping and dancing. We see the morning stiffness and pain that can leave you unable to walk at times. They hear laughter as you play with your friends. We hear the screams of terror on injection day. They see a child looking healthy and well. We see the sickness that comes after the injections at the weekend. They don't worry too much about kids with minor coughs or colds. Our hearts fill with dread knowing you could end up in hospital. They can't understand how an illness that affects your joints could also cause blindness. We need to be aware that it can. They enjoy Christmas and New year's eve without a care in the world. They don't see the phonecalls made in the middle of the night when your temperature is high. They think chicken pox is a minor childhood illness. We know you endured a week in hospital with a drip in your arm and the pain of having the canula changed each time it blocked. They don't have to diarise a multitude of medicines to make sure a dose isn't missed. Our alarms ring throughout the day with reminders of what medication is needed next. When they think of bravery they may think of a superhero or movie character. For us, you are the bravest person we know. Strength is going through what you go through week in week out without any end in sight. Courage is knowing it's going to hurt but knowing you have to endure the pain of your injections in the hope of a better tomorrow. Tenacity is letting them attempt to get blood a third and fourth time when it hurts like hell and tears are streaming down your face. 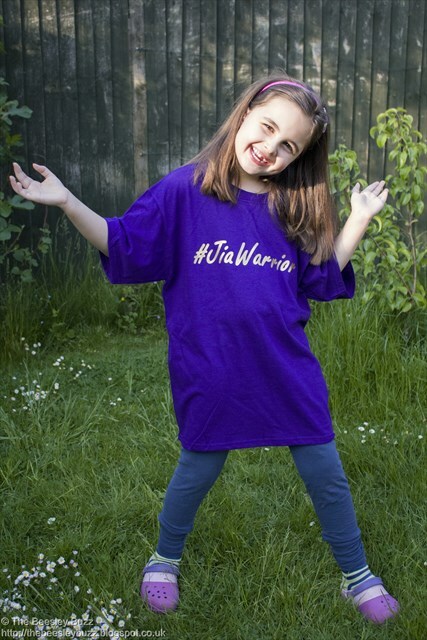 I wish more than anything that you didn't have to be a JIA warrior but you are one and you are an amazing one. Keep smiling your beautiful smile precious one - we can't take your pain away but please know that we are in this fight together with you.